Water quality monitoring and event detection systems (EDS) acquire water quality instrument data from supervisory control and data acquisition (SCADA) systems in real time, validate and process the data, analyze it for potential water quality “events,” alarm appropriate parties, and provide associated software administration, data analysis and reporting tools. Using the US EPA’s CANARY software package as the starting point, the Tetra Tech–Eyasco Team developed and implemented an event detection system that collects data from online water quality analyzers at over 25 locations throughout the distribution system. Measurements from nine primary water quality parameters were selected, including turbidity, chlorine residual (chloramines as total chlorine) and TOC. Data is collected on a five-minute interval and passed through a preliminary QA/QC process. Data are then forwarded to CANARY for statistical analysis in real-time. Results of each five-minute cycle are then combined over time to identify potential Water Quality Events and if necessary are then forwarded to the appropriate personnel for review and action. The Merlin System includes visualization and data access tools to help the Utility personnel evaluate the potential Water Quality Event. 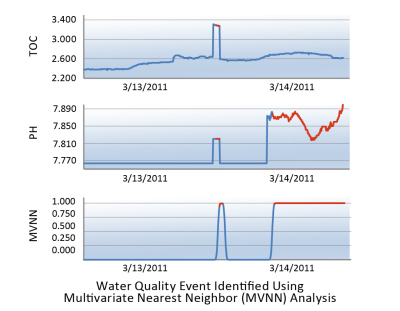 A primary challenge in the development of the event detection system was establishing the ability to distinguish between normal variation in water quality and changes in water quality which require operator attention (e.g., changes triggered by the presence of contaminants). In the course of developing the detection system, we recognized a gap that exists between the observed data structures and the assumptions of the existing water-quality change detection algorithms. Tetra Tech developed an innovative approach (Rare Event Detection Software, REDS, algorithm) that captures the unique multivariate data structure of water-quality measurements at individual sites and uses this information as a basis for identifying anomalous events. The event detection system is fully deployed on the client’s business network and all preliminary data model training tasks have been completed. This new Tetra Tech EDS gives utilities the ability to use the vast amount of water quality data that they collect to better understand the processes that are occurring in the drinking water distribution systems. While the system is not meant to replace the insight of the professional water quality experts, it will help identify anomalous conditions that may require intervention to optimize water quality. This tool can also be used to control costs of treatment and to mitigate risks related to distribution of water that may not meet a utilities own standards.